Automotive Sales Consultant is responsible mainly for selling vehicles, they are also equally involved in enhancing the sales volume, dealership profit, and customer satisfaction. 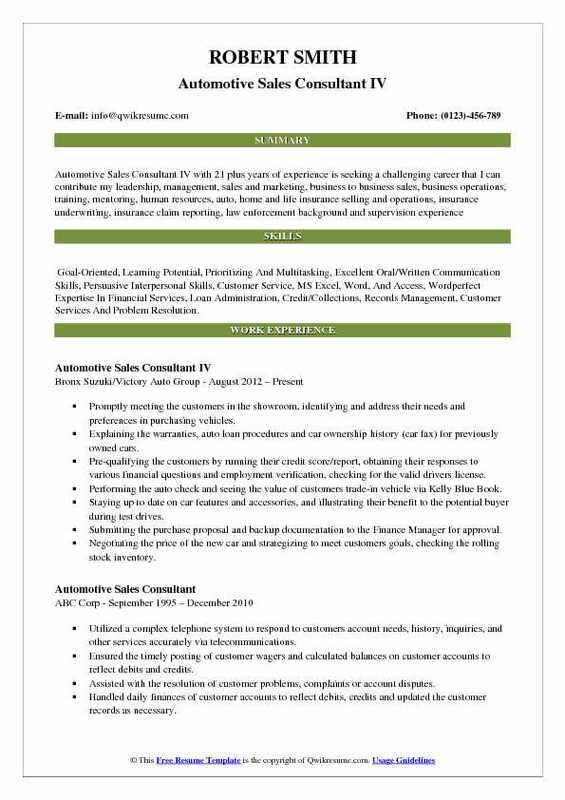 The common responsibilities mentioned in the Automotive Sales Consultant Resume sample include determining customer’s vehicle needs, suggesting the right vehicle, demonstrating vehicles, conducting test drives, arranging vehicle loans, collecting necessary documents, collaborating with management and arranging special offers or discounts for customers, delivering vehicles, devising strategy for vehicle promotion, incoming inventory checks, arranging accessories, attending sales meeting and assisting customers to service department personnel for repairs and services. Automotive Sales consultant job is best for those who possess strong verbal communication and automotive technical skills with a pleasing personality. 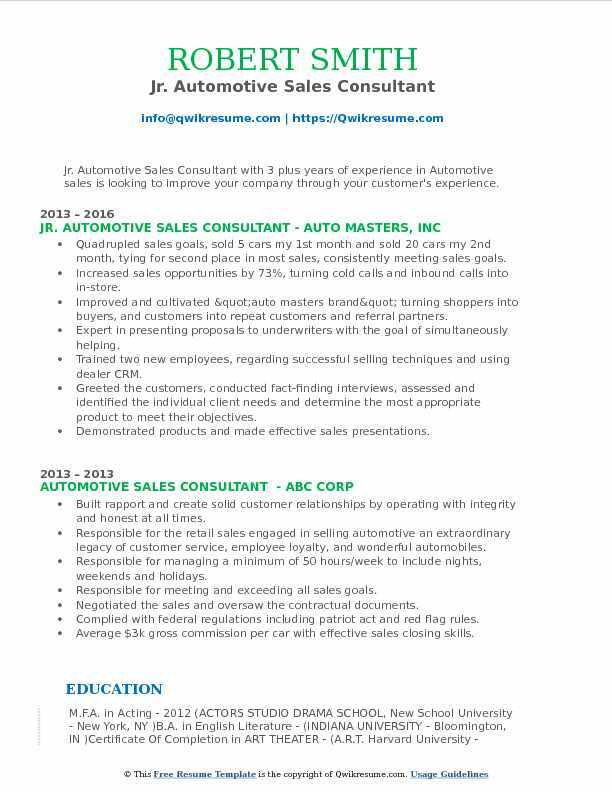 This job post does not require any specific educational qualification; however automotive companies do prefer a resume that depicts a high school diploma with ample sales experience. 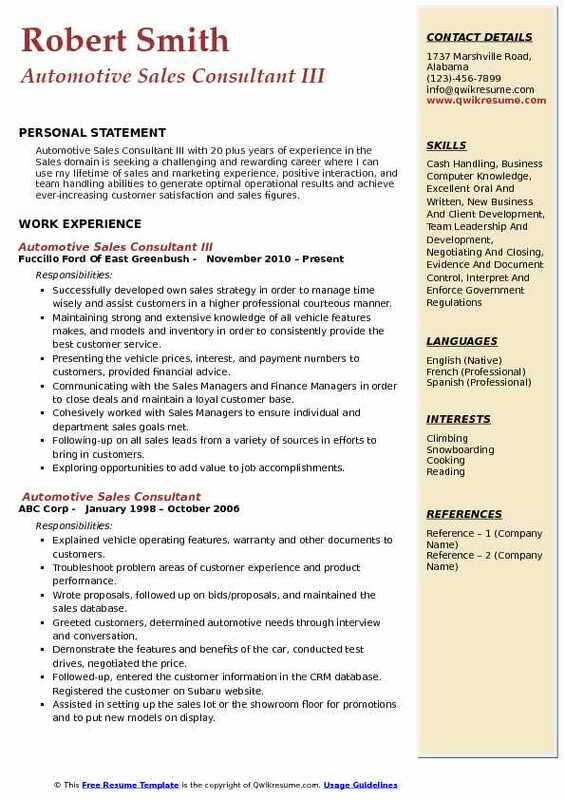 Objective : Automotive Sales Consultant with 1 year of experience is seeking to obtain a position where I'm able to demonstrate my professionalism in customer service. Skills : MS Office, Proficient, Reliable And Dependable, Approachable, Outgoing Personality, Dedicated Team Player, Team Player Mentality. Relationship Selling. Understood automobiles by studying characteristics, capabilities, and features. Responsible for closing sales by overcoming objections, asking for sales. Negotiated price, completed sales or purchase contracts, explained provisions. Explained and offered warranties, services, and financing collected payment. Assisted in setting up the sales lot or the showroom floor for promotions and to put new models on display. Comprehensive knowledge of the vehicle products, technology, and business practices. Fill out a guest sheet asking questions and use this information to determine the best vehicle for each customer. Able to explain all the purchasing procedures, vehicles features, and product warranties. Objective : Dedicated Automotive Sales Consultant with one plus years of experience and demonstrated an ability to train, manage and motivate team members to achieve organizational objectives. Constant contact with customers through email, telephone, and snail mail, using CRM. Going above and beyond for each and every customer. That means even after the sale. Explained the product performance, application, and benefits to prospects and described all optional equipment available for customer purchase. Followed-up on all post-delivery items including tag/title work and any special requests to ensure customer expectations have been met. Explained vehicle operating features, warranty and other documents to customers. Facilitated communication over prospects on a day-to-day basis by phone, mail, and person to person. 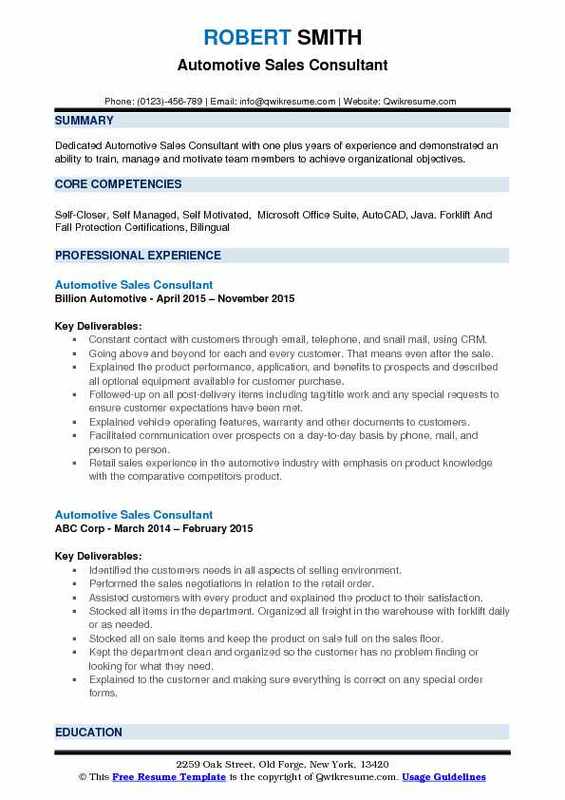 Retail sales experience in the automotive industry with emphasis on product knowledge with the comparative competitor's product. 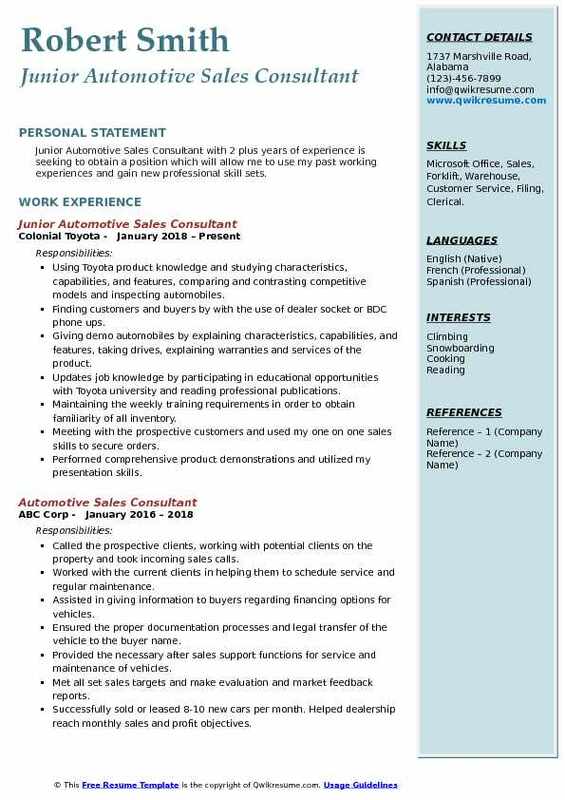 Skills : Goal-Oriented, Learning Potential, Prioritizing And Multitasking, Excellent Oral/Written Communication Skills, Persuasive Interpersonal Skills, Customer Service, MS Excel, Word, And Access, Wordperfect Expertise In Financial Services, Loan Administration, Credit/Collections, Records Management, Customer Services And Problem Resolution. Promptly meeting the customers in the showroom, identifying and address their needs and preferences in purchasing vehicles. Explaining the warranties, auto loan procedures and car ownership history (car fax) for previously owned cars. Pre-qualifying the customers by running their credit score/report, obtaining their responses to various financial questions and employment verification, checking for the valid driver's license. Performing the auto check and seeing the value of customers trade-in vehicle via Kelly Blue Book. Staying up to date on car features and accessories, and illustrating their benefit to the potential buyer during test drives. Submitting the purchase proposal and backup documentation to the Finance Manager for approval. Negotiating the price of the new car and strategizing to meet customers goals, checking the rolling stock inventory. Summary : Dedicated and focused Senior Automotive Sales Consultant with 7 plus years of experience and who excels at prioritizing, completing multiple tasks simultaneously and following through to achieve project goals. Seeking a role of increased responsibility and authority. Experience in sales, business development, and marketing, in highly competitive industries. Proven producer of sales and profit with an ability to pinpoint business opportunity. Ensuring the compliance with federal credit handling laws. A personable and outgoing salesperson with a strong record of success in closing sales and encouraging add-on services, such as warranties. Designing and maintaining the informational and interactive websites to specifically target and secure the business of online customer base. Maintaining multiple sites and social media on daily basis to maximize sales. Making sure that the buyer's order is signed by the customer and car insurance is in place. Following-up with customers to determine post-sale satisfaction or reasons for delaying the purchase. Explaining to the customers how to build credit and resolve negative credit issues. Completing successfully all special projects or assignments relating to customers. Writing thorough and attention-getting descriptions of inventory that result in sales leads and have secured. 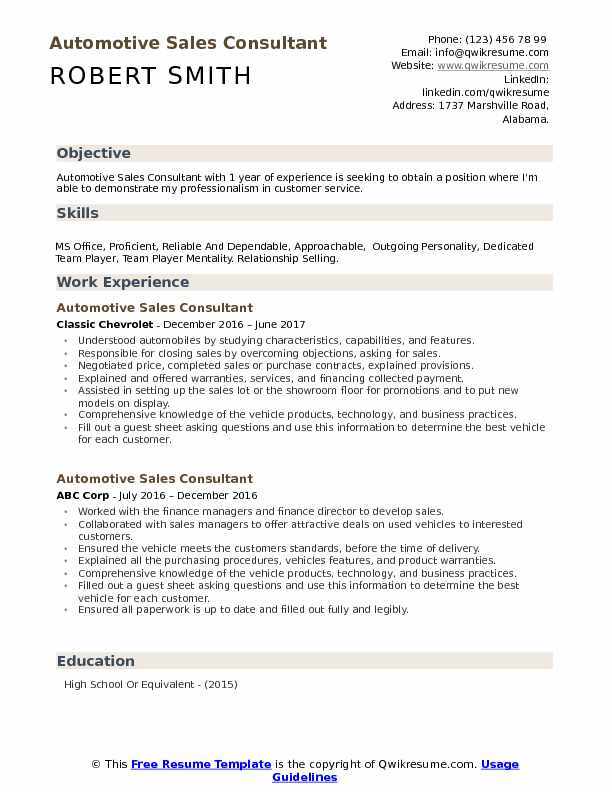 Objective : Junior Automotive Sales Consultant with 2 plus years of experience is seeking to obtain a position which will allow me to use my past working experiences and gain new professional skill sets. Skills : Microsoft Office, Sales, Forklift, Warehouse, Customer Service, Filing, Clerical. Using Toyota product knowledge and studying characteristics, capabilities, and features, comparing and contrasting competitive models and inspecting automobiles. Finding customers and buyers by with the use of dealer socket or BDC phone ups. Giving demo automobiles by explaining characteristics, capabilities, and features, taking drives, explaining warranties and services of the product. Updates job knowledge by participating in educational opportunities with Toyota university and reading professional publications. Maintaining the weekly training requirements in order to obtain familiarity of all inventory. Meeting with the prospective customers and used my one on one sales skills to secure orders. Performed comprehensive product demonstrations and utilized my presentation skills. 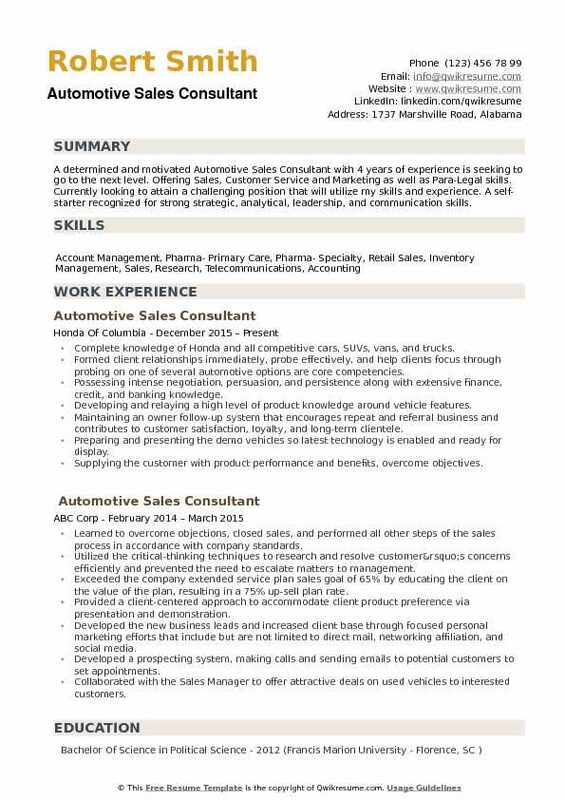 Headline : A self-motivated Automotive Sales Consultant with 5 plus years of experience in sales. My specialty is to be able to build rapport with people of various backgrounds which quickly builds a relationship of trust and establishes credibility. Through this relationship, I am able to identify the customers wants and needs and ensure the customer has a positive experience where they become customers for life. . Skills : Microsoft Office, Presentations, And Public Speaking, Technical Writing, Inventory Management, Sales, Research, Telecommunications. Greeted and actively listened to customers to uncover purchasing needs and provide recommendations based on automotive requirements. Used consultative sales process to match customers with vehicles suiting their needs. Demonstrated vehicle functionality and explained options, accompanied prospective customers on test drives and explained costs associated with the purchase. Researched new automotive releases to maintain knowledge on new products and trends. Informed and sold customers on associated dealer services and products such as extended warranties and protection packages. Investigated clients needs and wants to determine which vehicles would be a good fit for them. Presented the vehicle, followed with the test drive, presented figures and overcame any objections, prepared all required documentation. Objective : Jr. 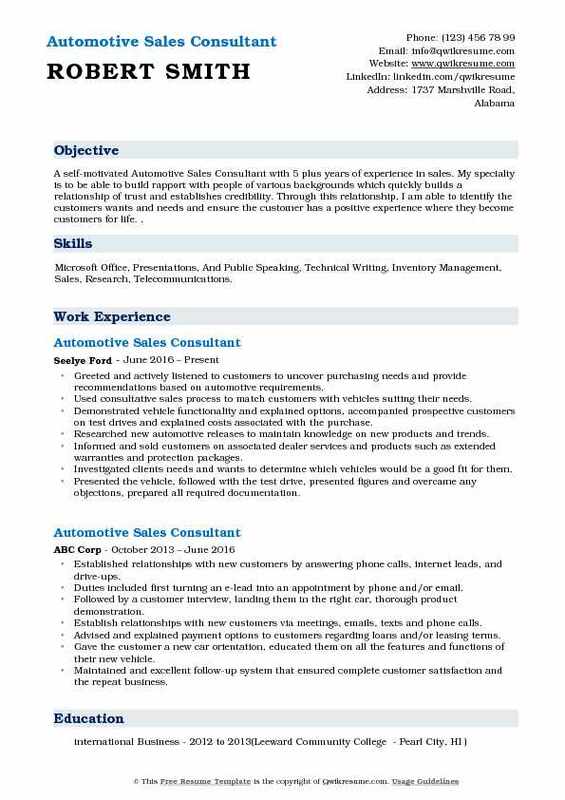 Automotive Sales Consultant with 3 plus years of experience in Automotive sales is looking to improve your company through your customer's experience. Quadrupled sales goals, sold 5 cars my 1st month and sold 20 cars my 2nd month, tying for second place in most sales, consistently meeting sales goals. Increased sales opportunities by 73%, turning cold calls and inbound calls into in-store. Improved and cultivated "auto masters brand" turning shoppers into buyers, and customers into repeat customers and referral partners. Expert in presenting proposals to underwriters with the goal of simultaneously helping. Trained two new employees, regarding successful selling techniques and using dealer CRM. Greeted the customers, conducted fact-finding interviews, assessed and identified the individual client needs and determine the most appropriate product to meet their objectives. Demonstrated products and made effective sales presentations. Objective : Jr. 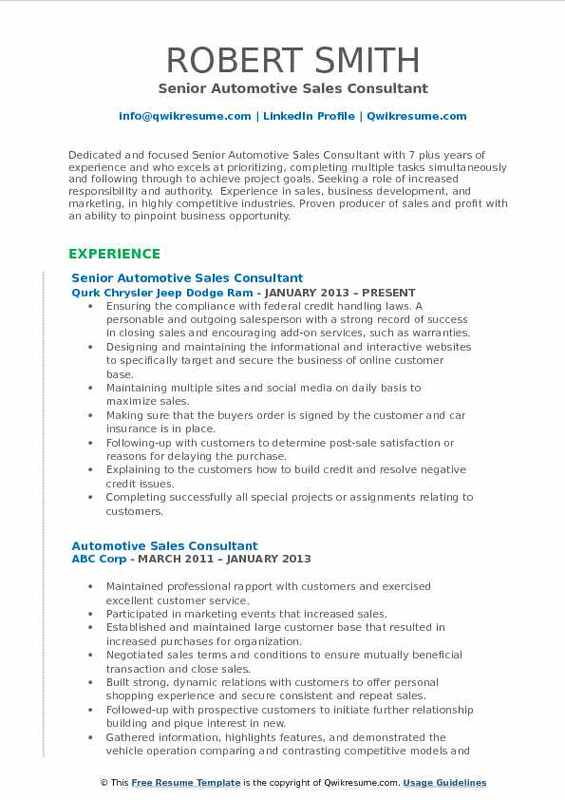 Automotive Sales Consultant with over three years of experience in the banking and financial services industries. Broad background includes building and maintaining client relationships, creating process improvements, working closely with customer service to analyze and trouble shoot customer inquiries and issues. Now seeking a career as an Entry Level Recruiter where I can utilize my strong business development skills. Responsible for sales of new Chevrolet cars and trucks as well as used cars in inventory. Responsible for approaching new customers and implementing a ten-step sales process start to finish. Utilized social media to stay in touch with existing clients and interest prospects in vehicles. Utilized marketing techniques and personal networking to become the most prolific sales professional. Liaised with the dealer service department to ensure that vehicle repairs/preparations are carried out quickly and accurately. Surpassed the sales goals by as much as 100%, sold up to 16 cars per month, doubled the 8 units per month goal using personable communication, integrity and follow up. Communicated with management, presented the numbers, closed the deal, delivered the vehicle, and follow-up. 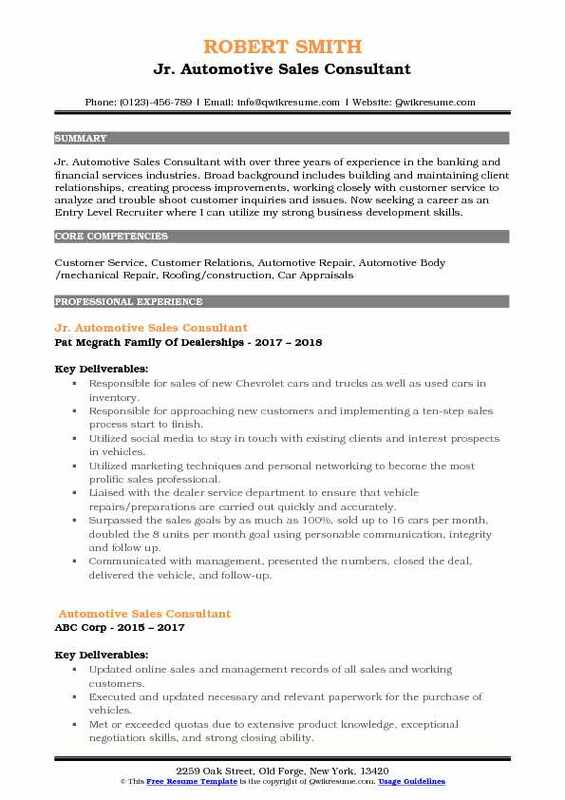 Summary : Automotive Sales Consultant III with 20 plus years of experience in the Sales domain is seeking a challenging and rewarding career where I can use my lifetime of sales and marketing experience, positive interaction, and team handling abilities to generate optimal operational results and achieve ever-increasing customer satisfaction and sales figures. Successfully developed own sales strategy in order to manage time wisely and assist customers in a higher professional courteous manner. Maintaining strong and extensive knowledge of all vehicle features makes, and models and inventory in order to consistently provide the best customer service. Presenting the vehicle prices, interest, and payment numbers to customers, provided financial advice. Communicating with the Sales Managers and Finance Managers in order to close deals and maintain a loyal customer base. Cohesively worked with Sales Managers to ensure individual and department sales goals met. Following-up on all sales leads from a variety of sources in efforts to bring in customers. Objective : A determined and motivated Automotive Sales Consultant with 4 years of experience is seeking to go to the next level. Offering Sales, Customer Service and Marketing as well as Para-Legal skills. Currently looking to attain a challenging position that will utilize my skills and experience. A self-starter recognized for strong strategic, analytical, leadership, and communication skills. Complete knowledge of Honda and all competitive cars, SUVs, vans, and trucks. Formed client relationships immediately, probe effectively, and help clients focus through probing on one of several automotive options are core competencies. Possessing intense negotiation, persuasion, and persistence along with extensive finance, credit, and banking knowledge. Developing and relaying a high level of product knowledge around vehicle features. Maintaining an owner follow-up system that encourages repeat and referral business and contributes to customer satisfaction, loyalty, and long-term clientele. Preparing and presenting the demo vehicles so latest technology is enabled and ready for display. Supplying the customer with product performance and benefits, overcome objectives. Reporting to the Sales Manager regarding objectives, planned activities, reviews, and analysis.